Even if you're new to do-it-yourself home improvement projects, you can follow these simple guidelines on how to lay sod and create a beautiful lawn. 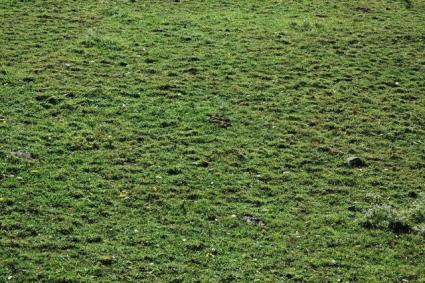 Sod transforms barren yards into instant lawns. Although sod costs more upfront than grass seed, you'll see immediate results. With conscientious aftercare, sod lawns grow rapidly and form instant landscapes. Commercial growers create sod by harvesting thick layers of well-grown grass in long strips. Choose a local grower to minimize transportation time and find a variety well suited to your climate and location. Many types are available for the homeowner. Fescue grass and zoysia sod are two types frequently used for lawns. A local grower can advise you on the best type for your particular climate and soil conditions. Once sod is delivered, prevent it from drying out by sprinkling it frequently with water until you're ready to set it in place. Keep it in the shade and lay it soon after delivery to ensure it remains vigorous. Laying sod takes approximately two weeks from start to finish, depending on the original condition of the area on which you plan to lay the sod. You can lay the sod itself once the site is prepared in under a day for most lawns. Before laying sod, test the soil. To conduct a soil test, dig out about a half-cup of soil from approximately six inches below the surface. Place the soil in plastic or glass containers. Take your soil sample to your local nursery, garden center, or state cooperative extension office. The state cooperative extension runs extension offices in most counties in the United States. These offices are staffed by agricultural experts who will conduct your soil sample tests. They will also advise you on appropriate amendments necessary to for growing sod lawns. After receiving the results of the soil test, add whatever amendments were recommended. Be sure to work them into the soil. Roots extract the nutrients and water from the soil, so the amendments must be mixed in well below the surface for the sod to access them. Site preparation may take a day or a week, depending on what is in the area now where you want to establish a sod lawn. Remove rocks, stones, and debris from the area. Apply soil amendments as recommended from the soil test. If there were no specific recommendations from the soil test, use a standard lawn fertilizer and apply according to package directions. The soil surface should be approximately one to two inches lower than the surrounding area. The sod will be about that thick, and you don't want the lawn higher than pathways or flowers beds! Lay each piece down with grass side up. Place pieces tightly together. Do not leave gaps. Avoid laying pieces in exactly the same pattern. When starting the second strip, alternate sections so that the seams do not line up. Use your sod cutter to create pieces of different lengths. Use the lawn roller to roll the sod in place and smooth it down. Sod lawns establish over time after the pieces are in place. Proper care of the newly placed sod ensures it establishes successfully into a lush lawn. After care includes appropriate watering, fertilizing, and mowing. Using your rain gauge or the empty coffee can, measure how much water Mother Nature supplies from showers and rainstorms. Newly planted sod requires about one inch of water per day. If you're not getting enough water or the weather is particularly dry and hot, water at least daily using the hose and sprinklers. Squirting water from the hose onto the lawn doesn't give the sod enough water. Gentle, prolonged sprinkling is better than one giant squirt from the hose. Pay special attention to areas where the sod squares adjoin one another and along edges of walkways and driveways. These areas are prone to drying out quickly and can kill or damage the sod squares. After the first ten days, you can adjust the watering schedule to about half an inch daily. Increase watering frequency if the sod begins to brown. Your new sod lawn establishes in approximately six to eight weeks. After the sixth week, turf professionals recommend applying a balanced fertilizer in amounts recommended by the manufacturer. A fertilizer marked 10-10-10 or 4-4-4 is considered balanced. You'll probably need to mow your newly planted sod lawn ten days to two weeks after initial planting. Let the lawn dry enough to mow safely. For the first mowing, leave the blade height of the lawn mower at the highest setting. Read up on basic lawn mowing tips to keep your lawn happy and healthy. Review basic lawn care tips to ensure a healthy lawn year-round. Landscape America includes a guide to laying sod.